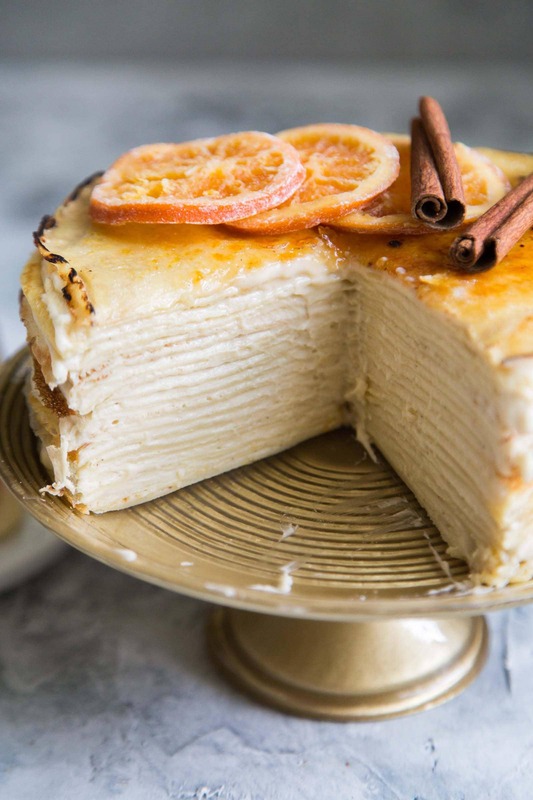 This orange cinnamon spiced crepe cake has 22 crepe layers and 21 layers of spiced pastry cream. That’s 43 layers in each bite. Thanksgiving is less than two weeks away! Have you bought your turkey? Have you planned your menu? Are you stressing out because Christmas is already next month? My answers: no, no, and yes. Thanksgiving doesn’t really phase me. I’ve never been in charge of the turkey. Sometimes I contribute a couple side dishes, but my only responsibility is to bring the desserts- a duty I happily and eagerly accept. Every year, I get the same requests: maple pumpkin cake, Filipino egg pie, and dozens and dozens of these classic chocolate chip cookies. 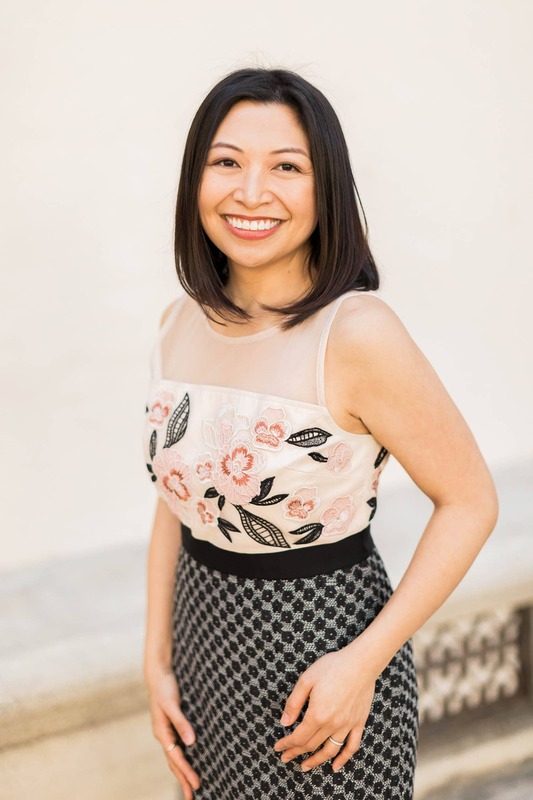 I don’t tire of making the same dishes every year, but I also like to throw in a few new recipes to keep my family and friends on their toes. 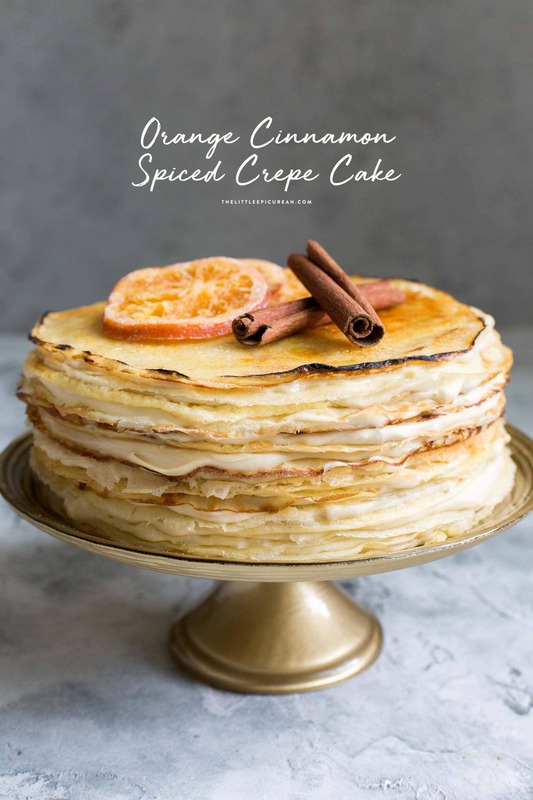 One dessert I have been waiting to make for the holidays- orange cinnamon spiced crepe cake! I love crepe cakes! Just look at all those layers! 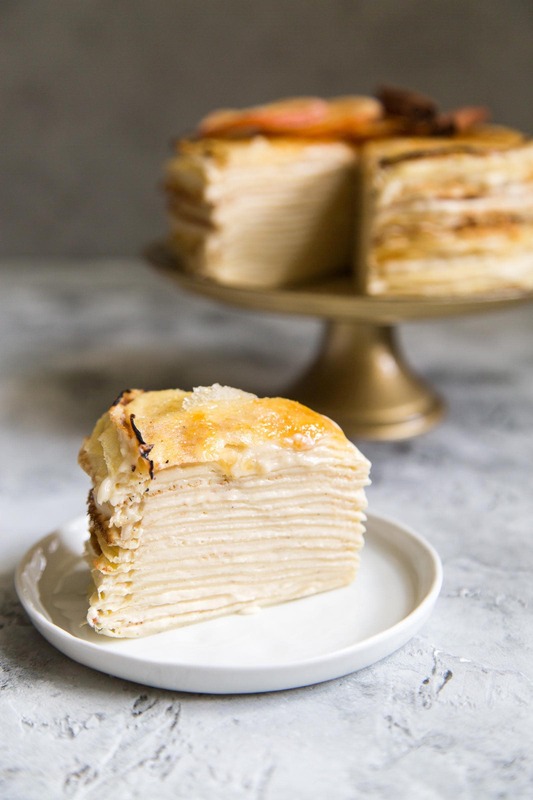 This orange cinnamon spiced crepe cake has 22 crepe layers and 21 layers of spiced pastry cream. That’s 43 layers of deliciousness in each bite. I first shared my love for crepe cakes back in 2011 during my early blogging years with this classic gâteau de crêpes. I used the same crepe batter recipe, but switched up the filling. I infused my pastry cream with this Hot Cinnamon Spice Tea which is a blended black tea with cinnamon, orange peel, and sweet cloves. It’s a super aromatic tea that works beautifully with pastry cream. Since crepe cakes are often one dimensional in texture (soft and creamy), I like to brûlée the top layer for a little extra crunch. While there are few components to this cake, it is time consuming. Unless you have multiple crepe pans, it takes about 45 minutes to cook all the crepe layers. To make crepe cake a little less daunting, I like to spread out the tasks over three days. Make the crepe batter on day one. Cook all the crepes on day two and store it in the fridge overnight. On the third day, make the pastry cream and assemble the cake. The assembled cake (before brûlée-ing) can chill in the fridge for up to two days before serving. Brown the butter. In a small pan, cook the butter until it is fragrant and the milk solids have turned golden brown. Pour into another container and set aside. In another pot, boil the milk. Turn off heat and allow milk to cool for 10 minutes. In a stand mixer fitted with a paddle attachment, beat together eggs, flour, sugar, and salt. Slowly add the milk and brown butter. Beat until smooth and well combined. Pour into an airtight container and refrigerate overnight (or at least 2 hours). In a saucepan, bring milk to a boil. Add tea bags and cover pot. Allow mixture to steep for 30 minutes. Discard tea bags. Pour 1 1/2 cup milk into a heavy bottomed sauce pot. Add 1/2 cup of sugar. Whisk together. Place over medium-high heat. Stir occasionally to make sure the milk does not burn along the sides or bottom of the pan. Bring to a boil. Meanwhile, in a medium bowl whisk together egg yolks, remaining 1/4 cup sugar, cornstarch, and remaining 1/2 cup milk. Whisk until smooth. Once milk has boiled, reduce heat. Slowly add about 1/4 cup of hot milk into cornstarch mixture. Whisk constantly to distribute the heat and temper mixture. Continue to add milk to cornstarch mixture until there are only a couple tablespoons of milk left in the pot. Pour all the egg-milk mixture back into the saucepot. Whisk constantly over medium-low heat until the custard has thickened. Continuing mixing and let the custard come to a boil to cook out any unwanted cornstarch flavor. Remove from heat. Whisk in butter and salt until smooth. Transfer the hot pastry cream into the prepared plastic wrapped sheet pan. Spread evenly. Cover with plastic wrap (allowing plastic wrap to touch pastry cream) and freeze for 10-15 minutes until the pastry cream has cooled to room temperature. Remove from freezer and transfer to an airtight container. Place plastic wrap directly on pastry cream to avoid condensation. Let chill in the fridge until ready to use. Bring crepe batter to room temperature. Use crepe pan 8 or 9-inches in width. Place crepe pan over medium heat. Lightly grease surface with oil and add 3 Tablespoons of batter. Tilt pan in a circular motion to cover the surface of the pan. Whip the heavy cream with sugar and whiskey to soft peaks. Fold whipped cream into pastry cream in three additions. Lay one crepe on a cake plate. Spread a thin layer of pastry cream over crepe. Cover with another crepe and repeat to make a stack. Save your best looking crepe to place on top. Chill cake for at least 2 hours before serving. If desired, sprinkle about two tablespoons of sugar on the top crepe and caramelize with torch. Serve immediately. I used this Hot Cinnamon Spice Tea. It is an assertive black tea blend with cinnamon, orange peel, and sweet cloves. Substitute any standard black tea and add one cinnamon stick, three inch orange peel, and three cloves. Alternatively, use your favorite spiced black tea. I used this 8-inch crepe pan. 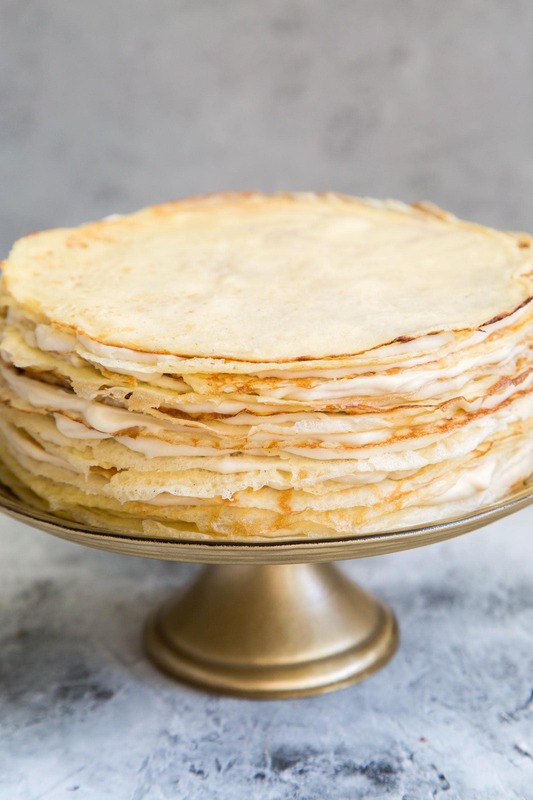 Spread out tasks to make crepe cake less daunting. Day 1: Make crepe batter. Day 2: Cook all the crepes and store in the fridge. Day 3: Make pastry cream and assemble cake. This is pretty cool and tasty looking. I had never seen this before. Gorgeous cake! I love those candied oranges on top! Can’t wait to try this recipe. I love that it is that simple and so beautiful. 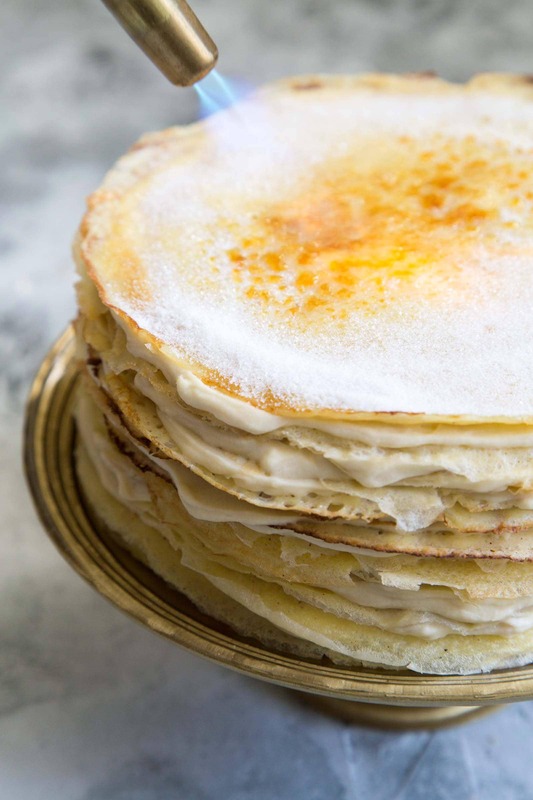 I agree that making crepe cakes can be quite time-consuming. Usually, I spread the tasks in 2 days; the first day is for cooking the crepes and the 2nd day is for filling and assembly. Thanks! It’s definitely a lot of work to do in one day! Oh wow, I love this cake so much already! I once tried something similar to this awhile back and it ended up looking like the leaning tower of Pisa. I’m definitely inspired to try again! 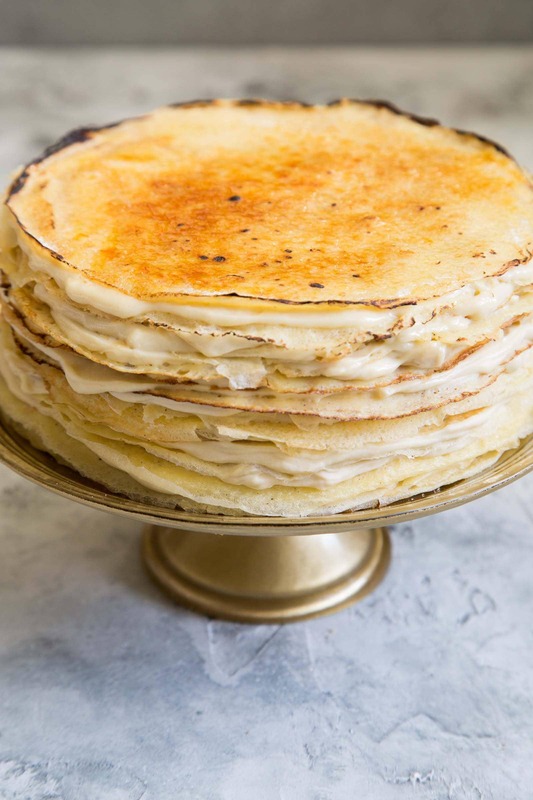 Some of my favorite flavors are in this crepe cake, which btw looks awesome! :-) Thanks for sharing! Do you think doing the brulee on a single crepe under the broiler before assembly would work? I haven’t tried that. I’m not sure it would work.